Avani denotes the Tamil month that falls between mid-August and mid-September. Avittam is the 23rd star among the 27 Nakshatras (stars). The day ruled by the star Avittam during the month of Avani, coinciding with the Purnima (full moon day) is celebrated as Avani Avittam. This is a very important ritual of the Brahmin community and is celebrated by all Brahmins globally. This day is of great significance to Rig and, Yajur Vedic Brahmins. On the next day, Gayatri Japa Sankalpam (chanting of the Gayatri mantra) is observed. This ritual is also known as Upakarma (beginning). Sama Vedic Brahmins observe Upakarma in Bhadrapada (mid-Aug to mid-Sep) on Hasta Nakshatra Tritiya (third waxing lunar phase). Sometimes, this might fall on Ganesha Chaturthi. Irrespective of the Veda, Gayatri Japa is observed by everyone on the day after Yajur Upakarma. ‘Upakarmam’ signifies the beginning of the study of Vedas. The Yajur Vedic Brahmins begin their 6-month-long reading of the Yajur Veda on this day, and they complete reading during the Makara (mid-Jan to mid-Feb) month. Avani Avittam is the most auspicious day for the Brahmin community. On this day, the male members of the Brahmins family change their sacred thread, which is usually performed on the banks of the rivers or ponds or in temples. Some people perform this ritual in their homes. Men undertake a Sankalpa or a vow for the sacrament of all the sins in the past. They take a holy dip and wear the new sacred thread called Yajnopavit or the Poonool. The first step is to offer prayers as a remedy for the sins. The prayer is offered for washing away all sins and gaining the divine blessings to carry out the basic duties of a Brahmin as prescribed in the Vedic texts. At the time of wearing the sacred thread, a mantra is chanted signifying the purity of the sacred thread, which is inseparable from God and is a tool to prolong life. This holy thread shall also impart strength and dignity. Similarly, while removing the old thread, a specific mantra is recited, which signifies the clearing of the old thread (the energies) and marks the new beginning. In simple terms, this day symbolizes retrospection and penitence to mark a new beginning. This day is also auspicious as the Brahmins offer Tarpanam (ancestral rituals) to their ancestors to whom they owe their birth and to the great Rishis to whom they are highly indebted for spiritual knowledge and the Vedas. Homas (fire prayers) are also performed. Lord Vishnu taught all the Vedas to Brahma, the creator God. Once, Lord Brahma mastered the Vedas; he was filled with pride about the supremacy he had gained over the knowledge of the Vedas. Lord Vishnu being unhappy with Lord Brahma’s pride and ego, created the demons Madhu and Kaitabha from two water drops on the lotus that he sits on. He then instructed them to steal the Vedas from Lord Brahma and hide it. Lord Brahma was deeply shocked and dismayed, as the most sacred scripture was stolen and that he was not able to save them. To retrieve the sacred text, Lord Brahma pleaded to Lord Vishnu, who took the form of a horse-headed man known as Hayagriva. He went to Madhu and Kaitabha and fought a high-pitched battle, tore them into 12 pieces and restored the Vedas to Lord Brahma, thus curbing his ego and pride. 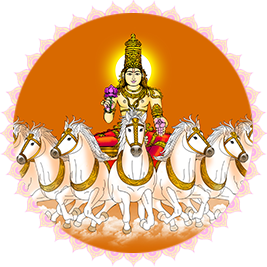 This day is also known as Hayagriva Utpatti or Hayagriva Jayanthi.